Perhaps you have to be a dog-owner to understand this bond of devotion. 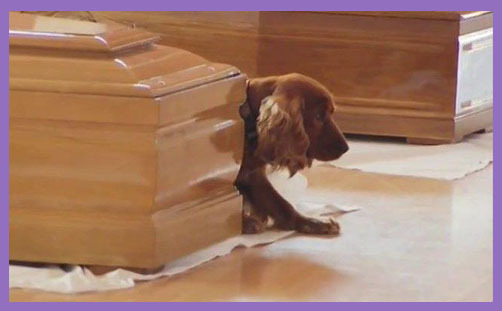 Just as a man will grieve for his best friend, so the best friend will grieve for his master. They just can’t let go. How can they, when the hand that stroked it, the legs that walked it and the soothing voice that whispered ‘Good boy, good boy’ all suddenly disappear? There was a loud noise, a rumble, lots of banging, crumbling and darkness. And then he’s gone. A whole world is swallowed in an earthquake. All dogs can do is run and bark. They don’t care if 281 people die and thousands are made homeless. They only care about one man and one home. Theirs. Selfish, perhaps, but they like to lick a familiar face and jump up a friendly soul. There’s clawing and scratching and lots of slobber. That’s love, that is. Some might think it a bit hurty and a lot messy, but, well.. it’s doggy. Death is hard. All that was warm and cuddly goes cold and distant. The collar doesn’t chink any more. The lead doesn’t come, the ears don’t flap. Who cares about dinner when the hand that feeds you isn’t the hand that stroked you every day since you were a puppy? It isn’t your kitchen. It isn’t your bowl. And your master has been bunged in a big box. You can smell him, but it’s a bit different. You can’t climb in with him, like you could jump on his bed and bounce and lick and bounce and bounce. It’s all hard and cold. You can’t bounce on hard and cold. Dogs have souls. They do. They really do. You might not think it when they come barking and bounding into the hallway with muddy paws and a soaked coat of matted fuzz, but look into their eyes when you’re sad, and you’ll know they care. It’s a spiritual thing. They want to be with you day and night, eating, watching telly, and settling on your pillow to sleep. They don’t care about the slobber and teeth marks and fur everywhere as they and roam their pad and gnaw felt squid and squeaky octopus. What’s theirs is theirs and what’s yours is theirs. It’s happy being a puppy, but getting older takes a different bite. When daddy fades away and disappears, all that’s left are dreams of splashing in streams and running through fields of buttercups. Watch the twitching paws when they sleep, and listen to their whimpers. That’s joy and bliss, choosing which toy to take from their box, and chasing uncatchable birds in a garden of adventure. When you cry, they want to comfort. When you leave, their life stops. The house is empty, and the garden is just dirt. O, they can sleep on another sofa or dig under a strange fence, but it’s not the same without their soulmate. It’s okay. You’re in a big, cold box, but I am watching over you. I will stay at your side. Thank you for being my friend.